What makes combined cycle power plants so efficient? A recent report by Black & Veatch shows that in the next one decade, the number of projects involving combined cycle technology will increase by a massive 3.1 %. There is only one reason for this projection: the high efficiency of combined cycle power plants. In this post, we will try to decipher what is the secret behind this efficiency. What is a combined cycle power plant? As the name combined cycle suggests, this type of power plant comprises of a combination of both gas and steam power production technologies. A combined cycle power plant relies on the simple fact that a gas turbine produces both power and hot exhaust gases. As the power is channeled to a generator, the hot gases are used to produce steam. This steam runs a steam turbine to produce extra power. How a combined cycle gas turbine (CCGT) works? Similar to a simple cycle gas turbine plant, the combined cycle gas turbine involves air inlet as the first stage. The air passes through a sizeable section where it undergoes cleaning and cooling depending on the control conditions. The aim of this process is to ensure that inlet air is safe for the turbine compressor. It is worth noting that air has several impurities that may damage the compressor and other turbine components. These impurities are generally categorized as solid state, liquid state and gaseous state contaminants. After purification, the air undergoes compression, combines with natural gas and then ignites. The ensuing expansion creates pressure that spins the turbine blades. At this point, the generator spins and produces power. As you might expect, this stage produces a substantial amount of waste heat. Unlike in the simple cycle plant, the CCPP directs the waste heat to another section. They call it a Heat Recovery Steam Generator (HRSG) because it captures the waste heat. Instead of going to the exhaust stack, this heat is directed to the steam turbine, where it generates extra power. Using this device, a combined cycle power plant is able to take advantage of the exhaust gases. As mentioned earlier, exhaust gases form part of the by-products of this process. Using a Heat Recovery Steam Generator (HRSG), a combined cycle power plant is able to take advantage of the exhaust gases. How does a Heat Recovery Steam Generator operate? Its process is simple: the hot gases heat evaporates water in tubes to produce steam. This steam in turn turns a steam turbine blades leading to extra power production. Combustion (gas) turbines may have increased in complexity over time, but they still comprise of three sections namely the turbine, the compressor and the combustion system. Combined cycle plants may also cost more than simple cycle plants (US$500 – 550/kW compared to US$389/kW according to estimates by the EIA), but they make up for that drawback in high efficiencies. How well do you understand the operation and efficiency of combined cycle power plant? In 2016, GE manufactured a combined cycle power plant with an efficiency of 62.22%. This went straight into the Guinness World Records as the most efficient at that time. As is evidenced by the rush for more efficiency, CCGT hold an advantage over simple cycle gas turbines when it comes to this area. Efficiency of this power plant is expressed in heat rates (Btu/kWh). Borrowing from this information from the U.S. Energy Information Administration, the CCGT appears to be the most efficient power plant type. The rise in efficiency is simply from the Waste Heat Recovery section of the unit. As you can see from the GE case, the efficiency of combined cycle power plant has already surpassed the 60% mark. Assuming the first cycle efficiency is 40% and the second cycle efficiency is 35%, the efficiency for the combined cycle comes to 0.40 + 0.35 – 0.40*0.35 = 0.61. This makes the CC efficiency much higher than individual cycles. With efficiency of combined cycle having reached unbelievable levels, you might think that is all about turbine performance. However, experts believe that there are still opportunities for even better efficiencies. High temperature metallic materials and temperature resistant ceramics will emerge. Generally, turbine technology will continue to advance. If you would like to learn more about the efficiency of a combined cycle power plant, we are here to share knowledge and expertise. The HRSG is undoubtedly the mainstay of any CCGT. You will also find these generators in many industrial processes. When it comes to power output of a CCPP, approximately one third comes from the steam turbine cycle. The other portion is produced by the gas turbine cycle. Although this combination normally increases power efficiency tremendously, high ambient temperatures in very hot areas may be a hindrance. To increase efficiency, it is necessary to optimize the components. What is the best way to achieve this optimization? Well, I would say that so far, the most reliable technology is Turbine Inlet Air Cooling (TIAC), which is ably offered by ARANER. Due to their high efficiency, combined cycles are one of the preferred technologies for power generation. However, they have big drawback: the performance of the combined cycle is reduced when the ambient temperature is high. This reduction on the performance and the dependency on the ambient conditions is a critical point because electrical peak demand periods are usually coincident with high ambient temperature periods. This means that when the combined cycle is most required, its performance is the lowest. This issue can be solved with Turbine Inlet Air Cooling Systems. Since a gas turbine breathes a lot of air, its efficiency is affected by anything that alters the quality (mass flow or density) of the air that goes to the compressor. Standard ambient conditions for a gas turbine are 15˚C temperature and 1.013bar pressure. Changes to these weather conditions are the most obvious changes and challenges that most power plants face. TIAC can help a combined cycle power plant located in a hot region to perform optimally throughout the year. Many plant owners in Saudi Arabia, Qatar and other generally hot countries have discovered the benefits of this revolutionary technology. 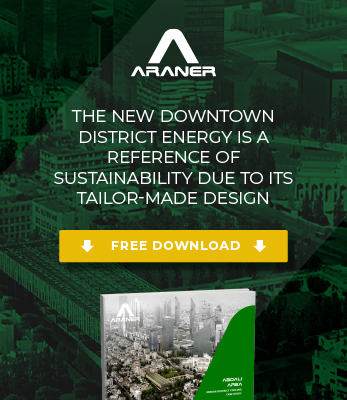 That ARANER has the technical capability to implement this technology during a retrofit or new plant design stage is not a secret. Since power plants do not necessarily operate in the same ambient conditions, it is impossible to have a standard power augmentation solution. That is the reason ARANER adopts a customized approach based on different factors. In cogeneration systems, TIAC comes in handy as it prevents power output loss in steam turbines for ambient air temperatures over the standard 15˚C. As noted earlier in this post, an ambient air temperature increase reduces the power output of a combustion turbine. Since the flow rate also decreases, there is a consequent reduction for exhaust gases produced, which in turn affects the HRSG’s steam generation. With the reduced steam output in the HRSG, it can only mean that power output reduces. ARANER’s TIAC solutions are definitely an answer to challenges of nature in the Middle East and gulf regions. As global energy demand continues to grow, combined cycle power plants are becoming more relevant. Therefore, plant owners and managers must pay special attention to the enhancement of power production in such systems. We all know it; no single gas turbine can have 100% performance. We will conduct countless feasibility studies and do intricate calculations, all in the name of getting to the root of this matter. Even as you do all these things, you should not forget that ambient weather conditions always have a bearing on performance of a combined cycle power plant. ARANER, through its widely acclaimed TIAC technologies, is the trusted provider of modern solutions towards enhanced performance of combined cycle power plants. Contact us for further information.